Remember when I went off an a big rant a while back about some very badly-designed pedestrian signals? My opinion has only strengthened since I wrote that diatribe. Those signals of insanity appear to be slowly taking over the whole country. I was in Norwich last week to talk about DOM Scripting and Ajax with the good folks at Norwich Union, two of whom I had already met at the dConstruct microformats workshop. While I was out and about in downtown Norwich during a lunch break, I couldn’t help but notice that the city was infested with the aforementioned signals. I brought them up during the Ajax workshop—they’re a perfect example of terrible affordances and even worse feedback; both very relevant aspects of Ajax interface design. Nobody had a kind word to say about the devices. One of the attendees described how, just that day, he had managed to stop an elderly couple from getting run over by a bus; they were understandably confused by the awful pedestrian signals. It’s quite gratifying that I everybody I talk to about this feels the same as I do. Those excruciatingly awfully-designed objects are going to cause fatalities, if they haven’t already. When I attended Reboot 8 earlier this year, it was my first time visiting Denmark. From the moment I left the airport in Copenhagen, I was struck by how smoothly everything seemed to work. On the train journey into town, Tom and I found all sorts of nice usability features in our carriage. You can tell a lot about a country from its public transport system and, based on my experiences, Denmark was like a country that had been designed by Apple. One week previously, I had been in Manchester delivering an Ajax workshop. There I saw a shockingly badly designed object. I had heard about these new pedestrian signals but nothing could have prepared me for how awful they are. Most pedestrian signals around the world work much the same way. 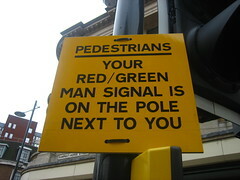 The signal is positioned across the road from the user above head height. The control for the signal is on the same side of the road as the user. The exact design of the signal and the control can vary enormously from place to place but the basic principle is the same. When the signal changes (red to green, “don’t walk” to “walk”, etc. 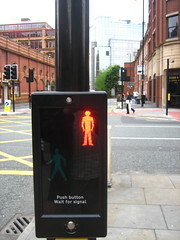 ), the pedestrian moves towards the signal. Because the signal is placed in the location that the user is trying to reach, it serves a dual purpose. It acts as an indicator of safety and as a goal. 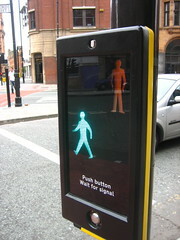 The pedestrian signals I saw in Manchester are placed at waist height. As soon as two or more people are waiting to cross the road, the signal is blocked. Worst of all, the signal and the control share the same space. Once the pedestrian begins walking, there is no safety indicator. When you’re halfway across the road, you have no idea whether or not it is safe. Oh, and there’s no audio signal either. That’s a feature built in to most of the older pedestrian signals in England that has been removed from these newer models. If you’re visually impaired, you are well and truly screwed. Even if you’re not, you’re missing a valuable safety cue. As is so often the case, accessibility features end up benefiting everyone. I cannot understand how these pedestrian signals made it off the drawing board, much less on to the streets of Manchester and other towns in the UK. It’s not just bad design, it’s dangerous design. Richard once told me about a risk assessment from his previous incarnation as an engineer. He had to determine whether workers on a pipeline above the arctic circle would be safe from polar bear attacks. The results showed that there was a chance that 1.5 people could be killed every thousand years. That was deemed unsafe. Human life is valuable. These pedestrian signals have clearly not been assessed for risks or tested for usability. Let’s be clear about this. These signals are new. They are inferior to the old signals. It costs money to remove the old pedestrian signals and replace them with the newer, more craptactular ones. Kathy Sierra wrote recently about differences between US and European design. This is something I’ve written about before. I don’t necessarily belief that design is better or worse on either continent, just that cultural differences underpin what is considered good design. It’s clear to me now that the design differences within Europe itself might be wider than the Atlantic ocean. The attitude towards design in the UK seems to reflect the attitude towards life; a grumbling acceptance that putting up with inconvenience is all part of the human condition. Perhaps secretly it’s the grumbling that we enjoy. The weather may be beyond human control, but the queuing, the public transport and the quality of beer aren’t. The Design of Everyday Things by Donald A. Norman would be a much shorter book had he never lived in England. Almost all of the examples of bad design are drawn from everyday life in this country, including the infamous slam-door trains. Terry Gilliam’s Brazil is a wonderful dystopian vision extrapolated from the England of today. As well as the usual repressive regime of all Orwellian futures, it depicts a life filled with beaureacracy, inconvenience and unusable design. We do this not to predict the future but to prevent it. I want to find out who is responsible for designing the new pedestrian signals, who is responsible for — forgive the pun — giving them the green light, and who is responsible for deciding where they are implemented. I don’t want to see these things on the streets of Brighton.